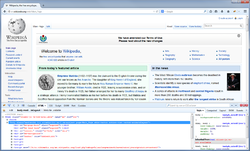 Firebug 2.0.1 running in Firefox 30.0 under Windows 7 with the HTML panel active on the main Wikipedia page. Firebug was licensed under the BSD license and was initially written in January 2006 by Joe Hewitt, one of the original Firefox creators. The Firebug Working Group oversees the open source development and extension of Firebug. It had two major implementations: an extension for Mozilla Firefox and a bookmarklet implementation called Firebug Lite which can be used with Google Chrome. In addition to debugging web pages, Firebug was used for web security testing and web page performance analysis. Firebug has been deprecated in favor of the integrated developer tools added to Firefox itself, whose functionality has been unified with those of Firebug. As Firefox 57 no longer supports XUL add-ons, Firebug is no longer compatible. On November 10, 2014, Firebug 3.0 was announced and an alpha was made available to the public. This version was to feature a new theme and would have focused on user experience. Firebug makes changes immediately and gives constant feedback to the user. All editors in Firebug support autocomplete. The HTML and CSS tools allow for the inspection and editing of HTML and CSS elements on a web page. Later versions of Firebug allow users to see live changes to the CSS. Visualization of CSS elements is shown while inspecting HTML elements. The Firebug layout tab is used to display and manipulate CSS property values. Furthermore, users can click on any visible HTML elements on a web page to access its CSS property values. Many extensions have been made to enhance Firebug. Since Firebug is open source, users can contribute their own extensions to the Firebug community. FlashFirebug is a paid Firebug extension that helps Flash and Flex developers debug Adobe SWF files on the web. FlashFirebug was developed by O-Minds and is licensed under the GPLv3. In February 2012, O-Minds purchased the code to FlashBug, a competing Firefox extension. Flashbug had extensive capabilities to parse AMF and Shared Objects objects and partially decompile Adobe SWF files directly in the browser. Soon after the purchase, O-Minds integrated key features of FlashBug into FlashFirebug and retired Flashbug from the AMO repository. Currently the extension displays textual Output from trace() commands within the Adobe SWF movie, a Display Tree with the hierarchy of display objects and their properties, viewers for AMF and Shared Objects, and a tool to modify the 3D transformation of any display object on the stage. ^ "Firebug Version History". Mozilla extension. 2017-02-16. ^ "High Performance Web Sites", Steve Souders, CACM, Dec, 2008. ^ "Saying Goodbye to Firebug". Mozilla Hacks. Retrieved 2017-10-24. ^ a b c Odvarko, Jan. "Firebug 2.0 Release". Firebug Working Group. Retrieved 15 October 2015. ^ Odvarko, Jan. "Firebug 3.0 The Next Generation". Firebug Working Group. Retrieved 10 November 2014. ^ Hewitt, J. (2007). Ajax debugging with firebug. Dr.Dobb's Journal, 32(2), 22-26. ^ Salkosuo, Sami (2008-05-06). "Debug and tune applications on the fly with Firebug". IBM Developer Works. Retrieved 6 May 2008. ^ Zukerman, Erez (2012-01-06). "Debug Web Pages in Firefox With Firebug". PC World. Retrieved 6 January 2012. Luthra, Chandan; Mittal, Deepak (April 7, 2010). Firebug 1.5: Editing, Debugging, and Monitoring Web Pages (1st ed.). Packt Publishing. p. 224. ISBN 978-1-84719-496-1. This page was last edited on 8 March 2019, at 03:54 (UTC).